I was really looking forward to getting back on the river today, I got to the pub in good time and there was a decent turnout of eight anglers including some more news in the shape of Gordon Aplin and his son Karl. Gordon’s face looked familiar and he said he used to fish matches back in the era of Adrian Green, Barney Crockett, Dennis Priddle and Don Jobson etc. Rob was in two minds whether to fish Coxes or Isle Brewers and I said we ought to fish the top end as it tends to fish okay early on before we get the first frosts. The club has several sections of river and we can’t keep fishing the same pegs week in week out. Rob was just about to announce the draw when Justin Charles ambled in without a care in the world and Rob had to put another peg in and amend the sections and payout before trying again. This time there were no interruptions and after I pulled a peg out of the hat I opened my hand to reveal the number 22, it wouldn’t be my first choice but it’s a peg I’ve wanted to have a go at for several seasons and now I had my chance. Heardy had drawn peg 27 in the copse and wasn’t happy, he’d been telling us how he’s been bagging up at Stafford Moor on the pellet waggler and his lowest weight this year was 82lb, we told him there was a good chance that wouldn’t be the case after today! As I parked up I could see Bruce and Fieldy stood on the bridge looking at the river and they said there were loads of fish in peg 17 where Bruce had drawn so nothing new there then! Rob had drawn peg 15 which I really fancied and young Karl was in the tank traps (peg 14) but I thought he might struggle a bit as he didn’t have a pole. I got to my peg and there was nice pathway strimmed through the nettles to the river so a big thanks to Fieldy who came down on Friday and did all the swims. 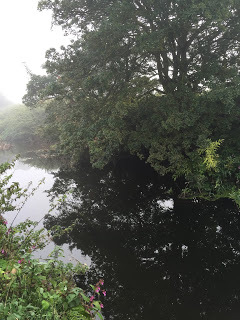 My swim looked really nice with loads of cover and overhanging bushes although the river was painfully low and clear. 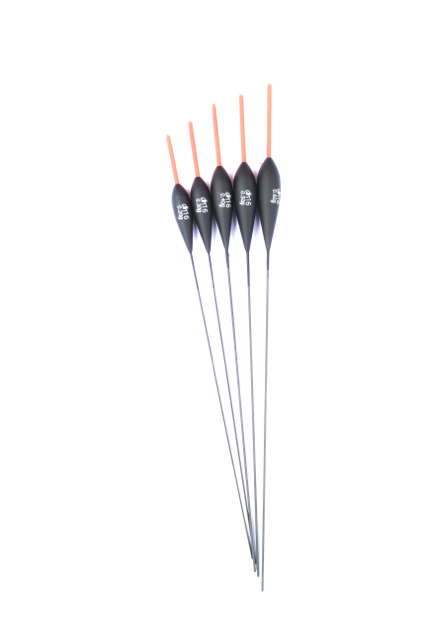 I went to Tackleuk yesterday to pick up my bait and they had some of the new Dave Harrell DH16 floats which I thought would be ideal for shallower swims and for when there’s not much too much flow so I bought a 0.5 gram and a couple of the 0.6 gram versions and actually made a few rigs up last night. I got the lighter version out and fine tuned the shotting before plumbing up, despite the river being very clear there was a good depth and I really thought I’d get a few today. I also set up a 0.75 gram Drennan Carbo and both rigs had size 18 Kamasan B611’s and 0.12mm hooklengths. As I was getting my bait out of my carryall, I realised I’d forgotten to bring any hemp and I hoped it wasn’t a bad omen. The start time of 10:15 arrived and I flicked some feed in the flow just in front of me and also fired some casters under the overhanging bushes where I hoped some chub might be lurking. I started fishing in the flow with caster on the hook and normally you’ll get a few early, mug fish, usually chublets and dace but this didn’t happen and I found myself searching around the peg earlier than I would have liked and I couldn’t buy a bite anywhere, not even from a minnow. I tried poking the pole right under the bushes at 11.5 metres but my nice shiny new float just sat there. I tried fishing at the same distance to my right where there was a bit more flow but nothing and it really was like the swim was devoid of fish. By now we were an hour into the match and Justin appeared behind me and said he hadn’t had a bite either, he did say Fieldy below him on peg 24 had two small chublets but it was already sounding like it was going to be rock hard today and he said he would probably pack up and head off somewhere else. I gave it another half an hour before going for a walk to see how the pegs further up were doing, I bumped into Stuart Alford and Pete Lonton who had popped down for a walk, they said Bruce was struggling in 17 but Rob was getting odd fish and Karl in the weirpool was getting a fish a chuck (so much for struggling without a pole then!). I sat behind Bruce for a bit and although he didn’t catch while I was there, odd fish were topping above him and we saw a decent fish swim up past him in the flow. Next stop was Rob and he said he’d caught a couple of nice trout along with some dace and chublets, I had a quick chat before walking up to see Karl, the swim did look lovely although a tree had come down across it since I’d fished it last and you can’t fish the tail of the swim any longer. I asked how he was doing and he said he’d been catching well but he was trying the tip and hadn’t caught on it yet. I left him to it and walked back, thinking it wouldn’t take a lot to get in the money today, Justin had long gone and left me the scales as a present – cheers mate! I thought my best bet was to try and catch a couple of decent fish under the bush but despite trying double maggot, caster and lobbie, I never had a bite. Out of desperation I even tried to catch a minnow on single maggot but with the same result and I couldn’t believe I hadn’t had a single indication! I tried upping the feed to force something to happen but to no avail. With ten minutes to go I thought I’d had a little knock and the float started moving but I struck and the caster wasn’t touched so I might well have imagined it and that was that, a blank and not a great start to my river campaign! I packed up and went down to weigh Fieldy in, he’d caught eight chublets for 1lb 9oz and there was a good chance he’d pick up money with that! 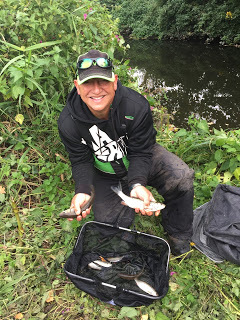 We met up with the others and it hadn’t fished very well at all, Karl had won with a decent net of fish weighing 8lb 1oz and had done really well in his first match with us, Rob was second with 4lb 5oz and Fieldy was third. Bruce won the top section with 1lb 4oz and Heardy only needed 9oz to win the bottom section and was still having a bit of a moan, I didn’t help when I suggested it might have had something to do with him fishing 8mm pellets! Steve Parker only had an ounce but it was enough to take a pound off me. Sat here typing this I still can’t believe it fished as hard as it did, I realise the river was really low and clear but it was mild and looking through my records the corresponding match in 2013 was fished in similar conditions and I had 7lb 13oz from peg 23 and only won my section and Steve Parker had 6lb 11oz from peg 27, whereas the weights today were more akin to matches held after a hard frost! At least we know pegs 14 and 15 still hold fish but I’m not sure I’d fancy fishing any of the others again for a while and then only if the river was up and coloured.